New iPad Air and iPad mini are better and faster — but which iPad should you buy? With recent updates to the iPad Air and iPad mini, it’s a good time to buy an iPad. This week, Apple upgraded these older model iPads, adding the newer A12 Bionic processor, a Retina True Tone display, and support for the Apple Pencil (1st generation). It’s a nice boost to Apple’s oldest iPads, which were becoming rather sluggish compared to newer models. The new chip increases the iPad Air’s speed by 70% and increases the iPad mini’s speed by a factor of three, so you can expect zippy performance from either tablet. These aren't the most expensive iPads, but they aren't budget buys, either: the new iPad mini will start at $399 and the new iPad Air will start at $499. You can pre-order both of them now from Apple, Best Buy, or your electronics retailer of choice. But while these upgrades were certainly needed, they make the question of which iPad to buy more complicated. Apple now offers iPads with five different screen sizes each with different amounts of storage as well as wi-fi and cellular options. If you’re in the market for an average-size iPad, you can now pick the iPad Air (10.5”), the iPad (9.7”) or the iPad Pro (11”), as well as the larger iPad Pro (12.9”) or the smaller iPad mini (7.9”). While the exact specs of these iPads vary, all of them now have recently-upgraded processors, Retina displays and Apple Pencil support. iPad ($329): 9.7" with an A10 processor. The slowest of the iPad models, this has a processor that’s three generations old — but it’s plenty to do most everyday tasks and it’s the most budget-friendly option. New! iPad mini ($399): 7.9” with an A12 processor. Though it’s slower than the iPad Pro models, the mini has just been upgraded with a faster processor and a sharper screen, making it a good buy for what you’re getting. Though the screen is smaller, it’s the perfect size to use as an ereader and it’s easier to carry around than the larger models. New! iPad Air ($499): 10.5” with an A12 processor. The Air is a middle ground between the iPad and the iPad Pro. It isn’t quite as large or quite as fast as the Pro, but it does offer a larger screen than the lower-cost models — plus a Smart Keyboard connector so you can use Apple’s keyboard (if you’re willing to pay an extra $160 for it). Think of the iPad Air as a budget version of the iPad Pro. iPad Pro ($799): 11” with an A12X processor. The smaller of the two iPad Pro models is better across the board than the less expensive iPads, though those improvements come with a big price jump. It has Apple’s latest, fastest processor, so it has plenty of power for games or graphics editing. 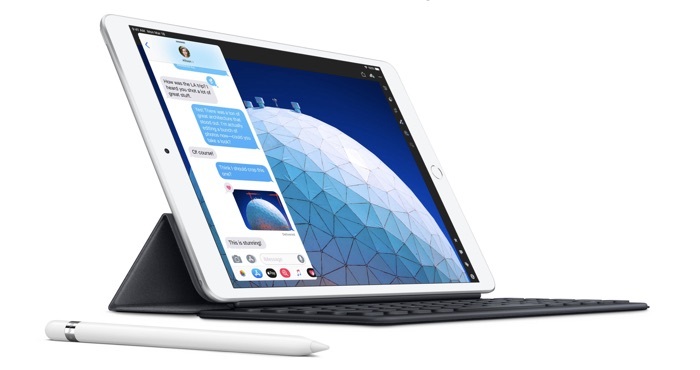 It supports the Apple Pencil 2 for more accurate drawing or writing and like the iPad Air it has a connector for the Smart Keyboard. It also trades Touch ID for Face ID, which lets it ditch the fingerprint sensor to make the bezel slimmer than earlier models. It’s a great tablet, and both artists and power users will appreciate the extra speed. iPad Pro ($999): 12.9” with an A12X processor. This giant version of the iPad Pro has all of the features of its 11” companion while adding nearly 2” of screen. That makes this iPad the size of a small laptop — and, for some people, it can work as a laptop replacement when paired with a Smart Keyboard folio. But it also costs as much as a laptop. For most people, the iPad or iPad mini offer a good set of features without being too hard on the budget. But graphics and video editors will appreciate the extra power the iPad Pro models offer, as well as the added sensitivity of the 2nd generation Pencil, which is ideal for creatives. The iPad Air sits in a strange middle ground — it's too expensive to be considered budget-friendly, and it lacks the improved processor and 2nd-generation Pencil support that make the iPad Pro appealing. If your ideal iPad is larger than a mini but faster than the base model, the iPad Air is what you need. Sales on Apple products are typically rare, but we’ve been seeing a number of iPad sales recently — and Best Buy is offering a discount for pre-orders on the new iPad mini and iPad Air. It’s a small discount — just $25 off — but that’s a great sale for a brand new iPad. To get the deal, you’ll have to sign up for a free My Best Buy account before ordering your iPad mini or iPad Air. Buying refurbished models from Apple — which come with the same warranty as a brand new tablet — can be a good buy, but be careful because these aren’t necessarily newer models. For example, right now you can find a base model refurbished iPad for $209 and a refurbished iPad mini for $239, which sound like great deals until you realize both are models with an older A9 processor. While we’re certain to see newer iPads in the refurbished store eventually, you shouldn’t expect to see them any time soon.